For almost a decade, Fife Flyers and Guildford Flames were great rivals competing for titles and silverware, and setting the bar across the sport’s BNL era. The teams led by Mark Morrison and Stan Marple were well matched, and featured some of the best players around. It’s remarkable to think 12 years have lapsed since they last went head to head. Flames’ return to top flight ice hockey was well overdue, but it took until the summer before they finally joined the expanding EIHL. After celebrating their 25th anniversary in 2016-17, Flames made the step up, and they should be an excellent addition. Flames have enjoyed wins over Cardiff Devils and Braehead Clan, and lost twice to Nottingham, once in overtime, and once on penalty shots. Add in another OTL loss to Manchester and start to get a sense of their competitiveness. Their poorest record, so far, is against fellow newcomers, MK Lighting, with three losses from three meetings, albeit two of them in pre-season. Five points from six games gives Guildford a mid-table berth, and now they make their first venture north of the border, but only after hosting Coventry Blaze at the Spectrum on Saturday. Fans who were around during the BNL era will recall the rivalry, much of it centred around player-coach Stan Marple who revelled in the heat of battle, nowhere more so than at Fife Ice Arena. Marple’s teams bristled with the best imports available, while Fife focussed strongly on their British core. They had history. It was Marple’s Swindon Ice Lords who, as southern champions, thumped Flyers, northern champions, in the 1996-97 UK play-off final which was part of the undercard at the Super League’s finals weekend at the MEN Arena in Manchester – Todd Dutiaume was also part of that short-lived Ice Lords team which enjoyed a comfortable victory. Marple and Fife were reunited in the BNL, and his head to heads with Mark Morrison were fascinating to watch; two outstanding player-coaches who would try to outfox each other on, and off the ice. 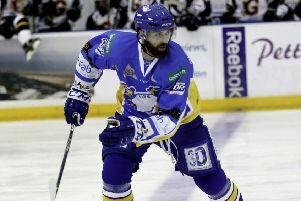 Mo triumphed at Hull as Fife beat Flames to clinch the British championship play-offs in the most dramatic fashion possible – sudden death penalty shots. They also won the league in 2000, only to lose it to Flames the following season - the English side sweeping to the league and play-off titles. That year also saw Marple claim silverware in Fife ice. The ntl:Cup may well be lost in obscurity, but it was significant because it saw Flames beat Fife at home and then travel to Kirkcaldy in midweek and win again. In front of his most vocal opponents, rarely has a coach enjoyed the moment more – the same Fife fans, his sternest critics, also being the first to applaud a worthy winner. Marple thrived in the heat of battle in Kirkcaldy, and soaked up the intensity. In doing so, he led by example, ensuring Fife-Flames matches stood head and shoulders above the rest. The Spectrum had a very different atmosphere, but one Fife fans also enjoyed as bonds were forged with the Barmy Firemen – a smashing bunch of Flames fans who created an online scrapbook packed with pics of players, supporters and guests all sporting the famous yellow helmets. The characters of the last decade have pretty much all moved on, but it’ll still be good to welcome back an old friend on Sunday.